Getting kids excited about brushing their teeth is like getting them exciting about, well brushing their teeth. At least at my house it is. When I say “time to brush your teeth,” I get “awww, come on!” So when Tanner’s Tasty Paste offered me their collection of yummy toothpastes for review, I was anxious to try them out. Tanner’s Tasty Paste: Toothpaste that tastes like dessert! Tanner’s Tasty Paste comes in cool flavors like Vanilla and Chocolate Basically, your two favorite dessert flavors! So I’ll be honest, I was a little skeptical. I’ve had flavored tooth paste before and it tasted, well, pasty. Amazingly, Tanner’s Tasty Paste has found some sort of magical way to make it taste the way they say it will taste: pretty darn yummy! When it arrived, I said to Jacob “check it out, flavored tooth paste!” I thought for sure he’d grab for the Vanilla because that’s his favorite ice-cream flavor. Instead, he opted for the Cha Cha Chocolate. The great thing: he was excited to try it out! I’m not saying after using it he was all about brushing all the time, but at least it got him interested! Since he laid claim to the chocolate I tried the Banilla Bling first. Like I said, I was expecting a pasty taste with a hint of flavor. I was really surprised to discover that brushing my teeth with the Banilla Bling was very much like tasting a vanilla ice-cream cone! It really is quite the Tasty Paste! What’s in Tanner’s Tasty Paste that makes it so yummy? The main source of the flavor comes from either vanilla extract or a natural cocoa base. 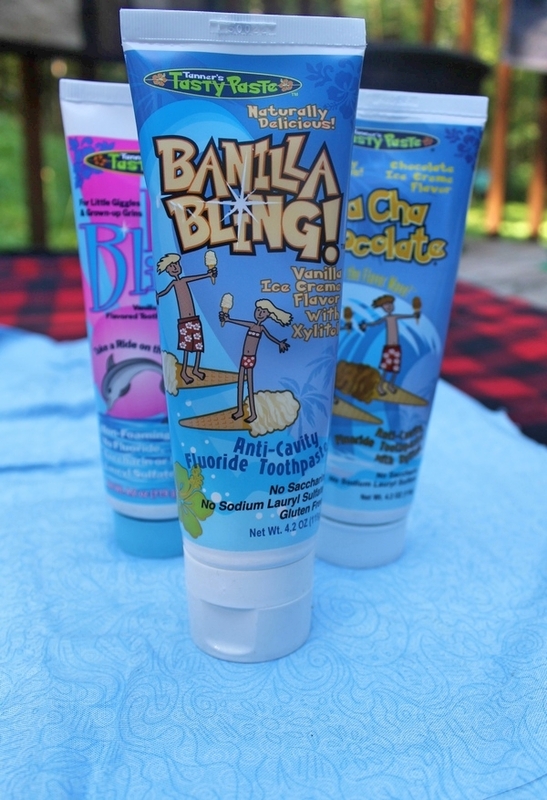 Tanner’s Tasty Paste in the Banilla Bling and the Cha Cha Chocolate flavors have fluoride to protect against cavities. The Baby Bling is more of a starter paste and does not have fluoride. It’s perfect for brushing baby’s gums and training young kids on good oral hygiene habits. All three contain Xylitol, which has been shown to be great for reducing plaque. What’s not in the toothpaste? For one thing, sodium lauryl sulfate, an ingredient that exists solely to create foam. My mom taught me that when she was a soap maker. She said it doesn’t really have any other purpose. It can, however, cause mouth sores, so it’s best to use a toothpaste like Tanner’s Tasty Paste in kids who are prone to those. Tanner’s Tasty Paste was created by a dentist, so you know it’s good for your children’s teeth. Dr. Janelle Holden created the delicious toothpaste after years of working with children and learning which flavors they liked best. Her goal is to give kids the best possible first dentist experience so they will go on to have a lifetime of healthy dental habits. Visit Tanner’s Tasty Paste online to order. Tubes retail for $6 each, but there are discounts for dental professionals (if you happen to be in that field). Trust me, if you have struggles with getting kids to brush, this is definitely something you want! 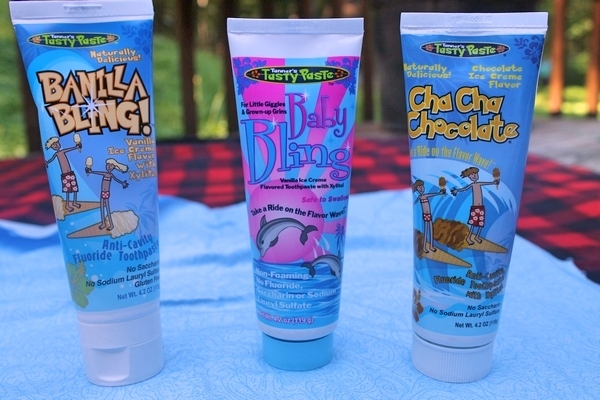 What flavor of Tanner’s Tasty Paste do you think your kids would like best? I’ve never heard of this before! I think my grandsons would most enjoy the Banilla Bling flavor! thank you for shring the information, the message was really helpful and useful. The Vanilla Ice Cream would be an awesome flavor to try. My nephew an niece would love these cute toothpastes. I did not know that the chemical in toothpaste is only to create foam. That is not needed. Some toothpastes are too strong. I like these! I didn’t know either until my mom got into soap making. Now I look for products without it.